OpenSignal released new findings this morning, ranking 4G download speeds in 35 major metropoles in the US between July and September. According to the report, Minneapolis ranks the highest in terms of download speeds, coming in at an average of 21.5Mbps. Second place goes to Detroit with 20.77Mbps and third place is Seattle at 19.06Mbps. Interestingly, Texas appears to be a rather slow state, with San Antonio, Houston, Dallas, and Austin coming in at an average of under 15Mbps. Last ranked Las Vegas came in at 11.65Mbps, which isn’t very good at all. On a more personal note, I’m happy to see Portland, OR rank in the top 15. Hooray for speed! For an in-depth look at how individual carriers perform in these markets, OpenSignal released that information in early August. 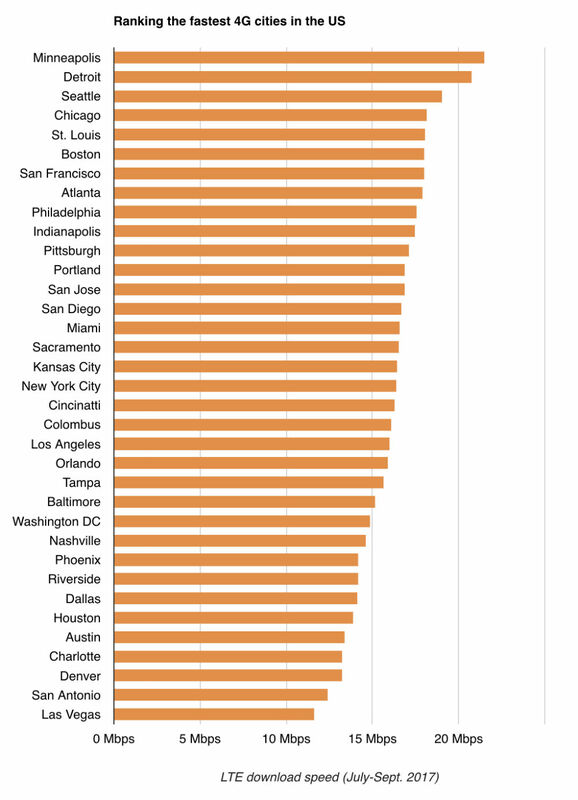 Now, check out the chart and see where your city sits.